The Innovative Finance ISA (IF ISA) has had a meaningful impact on the way property development is financed in the UK, and how investors can earn returns. It is now possible to lend your money to a property developer and earn tax-free interest on the loaned funds. Introduced in April 2016, the IF ISA allows investors to earn tax-free returns from investments in Peer-to-Peer loans, asset-backed securities (including property) and direct lending opportunities through online platforms. Previously, investors could only access tax-free savings through a cash ISA and tax-free returns from the stock market through a stocks and shares ISA. According to the most recent HMRC data, more than £290m was invested in 31,000 IF ISA accounts during the 2017/18 tax year – a year-on-year increase of more than 700 per cent. Cash ISAs, which make up the majority of ISA subscriptions, typically only yield around 1%-1.5%, which considering inflation is currently 1.8% means many are actually losing money in real terms. Depending on the provider, IF ISAs can yield 3%-12% but it is worth noting that they do come with an increased level of risk and invested sums are not FSCS protected. A developer borrows £7,000,000 against a development that is valued at £10,000,000. The loan itself is made up of two parts, a first charge senior loan and a second charge mezzanine loan. The first charge loan is £5,000,000, or 50% LTV, and the remaining £2,000,000 brings the total LTV to 70%. The terms of the loans are such that once 50% of the development has been sold, the first loan must be repaid to the lender(s), and then once 70% of the development has been sold the second charge part of the loan must be repaid. Now, even if you invested in the second charge loan, the development only needs to be sold for 70% of the valuation in order for your capital to be returned in full. If you feel that this achievable, then development loans typically represent a high yielding and attractive investment. Your return comes from the interest earned during the term of the loan. In the example, the value of the development would have to drop 30% before your capital became at risk of not being repaid. There are of course risks here, and there are no guarantees. But, if you believe in the fundamentals of the deal on offer and that the LTV is an achievable sale price even if property values fall, then development loan bonds would be an attractive addition to a well-diversified investment strategy. Due to the nature of the risks involved and lack of appetite among banks to lend above 60% of a project’s value, development loans provide access to high yields for alternative lenders. The more risk a lender takes, the higher the yield they can command. In the example mentioned above, the first charge lenders will typically earn an interest rate of 5%-6% on their capital, whereas the second charge investors will receive 8%-12% or more. 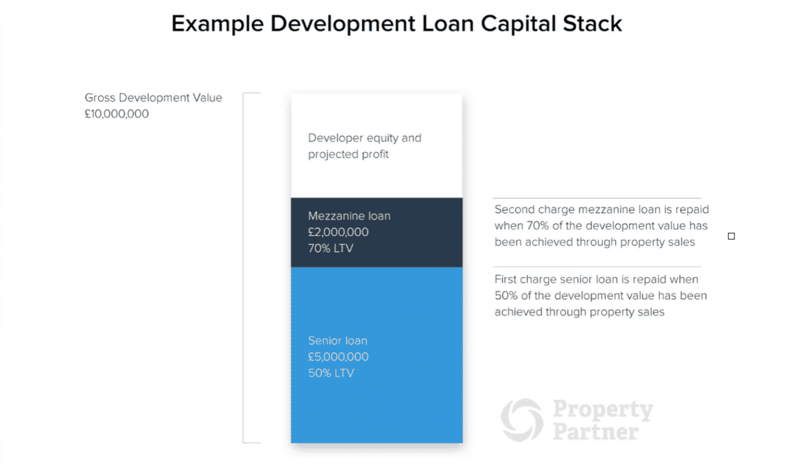 This is because the first charge lenders have taken on less risk – in our example, the development only needs to sell for 50% of the valuation in order for their capital to be returned. This is compared to the 70% sale price required for the second charge lenders before their capital is returned. Where you sit on the risk-reward spectrum is your choice. But for those with the appetite, 8-12% yields are achievable. We believe that any good investment strategy has diversification at the heart of it. Returns are never guaranteed, but investors can build a portfolio where the chance of losses are mitigated and diversification is a key part of that. Think of it in two ways. Firstly, the sheer number of investments you have. One property is a poor investment portfolio in our opinion. Anyone who has invested in a property will tell you that there are ups and there are downs. Boilers break, tenants can leave or councils can add a wild card to your hand for better or worse, to name a few. Having multiple property investments in your portfolio, in multiple locations mitigates some of these risks. Property Partner makes it easy to diversify your capital across multiple investments, many of which are made up of multiple properties (our largest student investment contains 80 rooms for example). It is unlikely 100 tenants will all stop paying rent, or that 50 boilers will break in a given month or year. The same is true for investing in development loans. Loans secured against schemes involving the construction of multiple properties are more appropriate investments we believe, and investing your capital across multiple developments again spreads your risk. Second, are your returns coming from a diversified source of investments? If all you do is invest in one type of asset, albeit in lots of them, are you diversified? If your portfolio is made up 100% of retail shopping centres, you are probably regretting that decision as the high street goes through a state of flux and you overexposed to sentiment and/or market dynamics in that particular type of property. Investing in development loans gives you exposure to a side of the property market that you might not have, being new builds. It also allows you to diversify the source of income in your portfolio. The ability for students to pay rent, for example, is different than the ability of developers to pay interest. Development loans provide an additional source of income for investors to consider in their mix. At Property Partner, all of our development loans go through thorough due diligence from our expert property team who have over 130 years of combined experience investing in and managing property. You can watch some interviews with our Chief Investment Officer, Robert Weaver here. The end of the tax year is midnight on the 5th of April. Even if you are unsure about what to invest in you can secure you ISA allowance by depositing into an ISA account before the deadline. Open a Property Partner ISA today and let us help you build your wealth through property. Capital at risk. The value of your investment can go down as well as up. The Financial Services Compensation Scheme (FSCS) protects the cash held in your Property Partner account, however, the investments that you make through Property Partner are not protected by the FSCS in the event that you do not receive back the amount that you have invested. Past performance is not a reliable indicator of future performance. Forecasts, if stated, are not a reliable indicator of future performance. Interest and capital returned may be lower than expected. Gross rent, dividends, and capital growth may be lower than estimated. 5 yearly exit protection, exit on the platform, exit in line with a specific investment case or fund strategy, subject to price and demand. Property Partner does not provide tax or investment advice and any general information is provided to help you make your own informed decisions. Customers are advised to obtain appropriate tax or investment advice where necessary. Financial promotion by London House Exchange Limited (No. 8820870); authorised and regulated by the Financial Conduct Authority (No. 613499). See Key Risks for further information.